People go to conferences to see friends, meet people and learn new things. Over 80% of people said that seeing friends and meeting new people was the reason they went to conferences or it was very important. 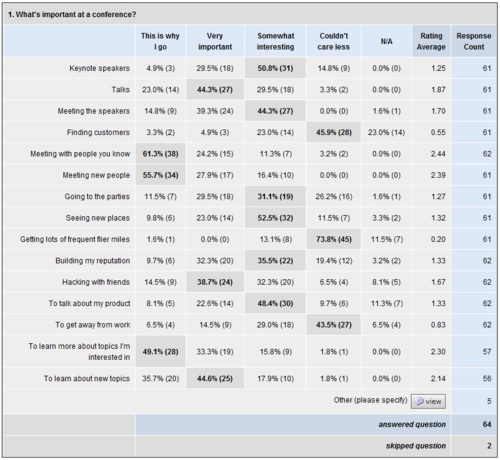 53% of people said "attendees they want to hang out with" is the reason they go to conferences. The comments really reflected this with people talking about how meeting people renewed their energy and many talked about how "fun" it is! Good speakers followed as a close second with 96% of people saying the talks were at least somewhat interesting. (Two thirds thought the talks were very interesting or the reason they go to conferences.) Interestingly enough 100% of people thought meeting the speakers was at least somewhat interesting. I didn't ask why they wanted to meet the speakers … I assume to talk to them about their topic but perhaps it's just meeting someone famous! Closely related to meeting people and listening to talks is learning new things. Both learning more about topics you are already interested in and learning about new topics ranked high for most people. But here's the data. You can see for yourself. This data is not necessarily statistically significant. I didn't ask for any demographic data. I recruited people on this blog and on twitter. That crowd is definitely not representative of the general population. (But I wouldn't want to ask the general random population about attending conferences.) You are welcome to use the data and blog about it yourself, just link back to here or explain where you got it from. In this first question, I added two items to the list after it started, so that's why the responses for the last ones are lower. 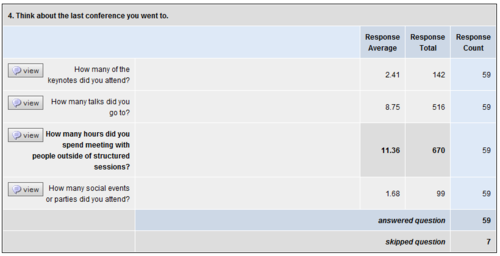 Also, the first two respondents couldn't pick an answer in every row. They alerted me to the problem and I fixed it for everyone else. I was impressed by how many people would go out of their way to see their favorite speaker speak again. Especially since most speakers tend to talk about the same topic. This question would have obviously been better as a percentage and I did open a new survey just for this question (redone) but very few people responded to that one. To learn something new, meet new people, and touch base with people I've met previously. I think good conferences are inspirational for the attendees, and I like to travel, so both thing make me go to conferences. To meet F2F with colleagues and come to concensus on how to solve the problems that vex us, where email/irc/other distractions simply don't allow progress to be made otherwise. A combination of the talks (news), friends and beer. I go to present, to meet people and to hang out in the "hallway track"
To Learn more about the organization and product. Because of the people I meet there! Its vital for making me feel that im part of a community made up of real people, not just hacking gods. The creativity blossoms at conferences, while there is some creativity in irc channels, i havent seen this offline creativity and lust for hacking replicated online. For the feeling you get that you are part of something big. Spending time with peers, interesting venues (fortunately I'm "new" enough that every conference has been a different city), renewing my interest in volunteering on specific projects. It's different for "work" conferences compared to "play" conferences. But in both cases you get a chance to hear the best in the field, make new contacts, learn what others are doing (find out the cutting edge), and publicise yourself/your company. To expand my circle of contacts and learn about new tech. I typically go to conferences to meet new people and hang out with old friends. However, it really depends on why I am at the conference. When I am at the conference for a project I am usually in a booth or talking to people about the project. I catch a few talks if I know they will be good. If I am at a conference for myself I usually hang out around booths, see a few talks and talk with people in the halls. If I am at a conference to attend for work I feel I have to see as many talks as possible and end up limiting my talking with friends and new people. I go to meet people, show what I've worked on, plan for future things. And to party! To hear other people opinions about the stuff I think I'm good in. And then to rethink if I'm really good. To gather with interesting people and listen to them talk about interesting things. To learn and to network. I think one of the reasons people like to talk to the speakers is that they often are the most interesting people at the conferences.. I guess they’re also picked as speakers because they’re interesting. That said, to me the talks are only interesting because the company I work for will only pay my full expenses if I’m speaking (and I think its also the case of many other companies). But if it wasn’t for that, I’d prefer a conference with no talks and just social events (ie parties) so I can socialize/meet/etc with as many people as possible. Honestly, I would prefer a conference with no keynotes that are not directly related to Gnome as such. So at last year’s Guadec, probably only Federico’s keynote was worth it. Previous PostPrevious Why do you go to conferences?